It's time for the first full-fledged farm report of the 2010 season. The sampling size is large enough to get a good feel for how the Brewers prospects are playing through the seasons first month. There are some status affirming performances (Jonathon Lucroy, Lorenzo Cain) and even a few early disappointments. Let's get to it. Peter Fatse - IF/OF - He may not have a position yet, but the 2009 24th round pick is off to a very hot start for the Timber Rattlers. 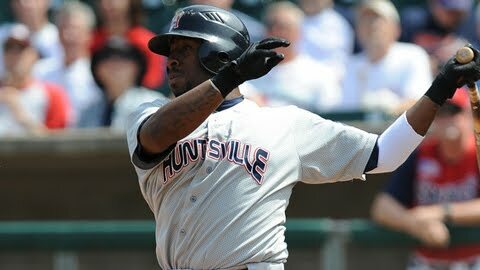 In the 11 games he's played Fatse has 3 triples and 2 home runs while batting .417. He did see some extended time with the T-Rats a year ago so a hot start isn't that surprising, but this good of a start warrants notice. Chris Dennis - OF - Dennis saw some time last season with Wisconsin, but was hampered by injuries. In limited time in 2009 he hit .312 with four homers and a .404 OBP, so far this season he's done well to prove those numbers weren't an aberration, batting .310 with an impressive .459 OBP. Ryan Gennett - 2B/SS - Gennett signed late last year, he was a 16th round pick, and saw no playing time in 2009. In his first taste of pro ball he's gotten off to a nice start, batting .320 with a .446 OBP. Keep on eye on him if you head up to the valley, at 5'9" he'll probably be easy to spot. Jake Odorizzi - SP - The highly touted Odorizzi has the good fortune of being overshadowed by last year's first round pick (Eric Arnett) in the rotation with him. Having taken a back seat to the hype Arnett will draw, Odirizzi has been the T-Rats best starter. He has an ERA of 1.50 and a minuscule .75 WHIP. Throw in 19 K's in 12 innings and you've got a terrific April. Eric Arnett - SP - Speaking of last year's first rounder, Arnett has been bad. His command has been there, he's only walked two against nine strikeouts, but he's been hit around a ton. Arnett's WHIP is 1.63 and he's given up four long balls, most on the team. Kyle Heckathorn - P - Heckathorn has been much better, his ERA is 2.25 and he's only given up 6 hits in 8 innings. It's still undetermined whether he'll be a starter or reliever but as long as he pitches well he's got a good chance at the majors. Erik Komatsu - OF - The 5'10" Komatsu is off to a nice start, he's second on the team with a .338 average and has nine extra base hits in 16 games, he also leads the Manatees with 33 total bases. His problem of late has been staying healthy and on the field, it would be nice to see what he can do in a full season. Kentrail Davis - OF - Davis is a very high ceiling player and was considered advanced enough that the Brewers assigned him to High A for his first professional action. In the seven games he's played he is batting .333. Keep an eye on him, he could climb the ladder quickly. Wily Peralta - SP - The righty Peralta has had a mostly good 2010 so far. His overall numbers are solid, an ERA of 3.00 and 21 strikeouts in 21 innings but his walks are a bit high, he's given the free pass to 10 batters already. That's an area he will need to improve on as the season marches on. Michael Fiers - SP/RP - Seriously who is this guy? Fiers burst on the scene last year with impressive command as a reliever and is now starting for Brevard County. 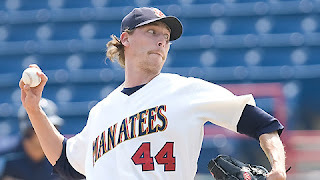 He has done very well for the Manatees too, sporting a 1.88 ERA and WHIP of just .92. If he keeps it up a promotion to Double-A is inevitable. Cody Scarpetta - SP/RP - Not good. A 1.92 WHIP and 6.00 ERA pretty much sum up Scarpetta's April. His command has just not been there yet this season but there is plenty of time to turn it around. Best of the Rest: Nick Green - RP - has an ERA of 1.04 in his rebirth as a closer, Lefty Daniel Meadows - RP - has continued to pitch well, he has an ERA of 2.70 in 13.1 innings. Lorenzo Cain - CF - It appears Cain was as disappointed with his 2009 as the rest of us were and he is determined to bounce back in a big way. Through the first 17 games of the year he's hit .380 with 19 runs scored. There have been reports that he's been placed on the DL with a hamstring injury so we'll keep an eye on that. Taylor Green - 3B - Green is another guy looking for a bounce-back year, after preseason wrist surgery caused him trouble in 2009. 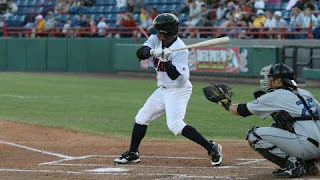 He's batting .328 on the young season and has hit 10 doubles all while driving in 13, which is tied for the team high. Caleb Gindl - RF - He can hit and he continues to prove it. Gindl is batting .299 and is tied for the team lead with 13 RBI's. Also his two homers lead the team. What is most promising are his early returns against left-handed pitching, Gindl has six hits in 13 at-bats giving him a .459 average. For the left-handed Gindl, hitting lefties would be a big step forward. Brett Lawrie - 2B - Good and bad so far for Lawrie. The good: He's got 3 triples and has driven in 12. The bad: Lawrie is only batting .225 and has struck out 23 times in 18 games. Keep in mind he hasn't played at High-A so he's skipping a level of the minor leagues by playing at Huntsville this year. Amaury Rivas - SP - You might like to see longer starts out of Rivas but his performances have been very good so far. Through four starts Rivas has a .78 ERA and holds a 3-0 record. He's walked 11 batters so far, which is something he'll need to improve on, but last year he was far more impressive in the second half of the season. Mark Rogers - SP - Same complaint as Rivas, you'd like to see more innings out of Rogers (he's made three starts and pitched 13.1 innings) but it is early in the season so it's not a major concern. Rogers isn't strikeout:walk numbers aren't as strong (12:10) but he's kept his ERA down (1.98) and has plenty to improve on as the season progresses. Best of the Rest - Zelous Wheeler - 3B - is batting .306 with a .433 OBP, Jim Henderson - RP - has an ERA of 1.35 through 13.1 innings. 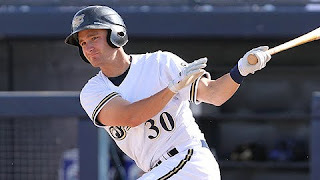 Jonathan Lucroy - C - After raking in Double-A (he hit .452) Lucroy was bumped up to Nashville to start in place of Angel Salome, who has landed on the Temporary Inactive list. What has Lucroy done for the Sounds? Oh just bat .400 through his first six games. So yea, Gregg Zaun, how about that. 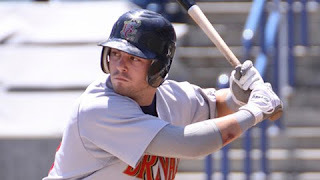 Eric Farris - 2B - Another second baseman who has skipped a level of the minors, Farris made the jump from Brevard County to Nashville in 2009. He has held his own so far, batting .278 through 19 games. A stolen base expert, Farris has swiped four without being caught. Adam Heether - 3B/UTIL - Heether is hitting for power in the early part of the season, he has five home runs, but his average is painfully low at only .205. Heether does have 13 RBI's though, expect to see that batting average go up. Marco Estrada - SP - The waiver wire claim has been the best starter in the Nashville rotation in the season's first month. His WHIP is a very impressive .83 and he's kept his ERA under three (2.74). 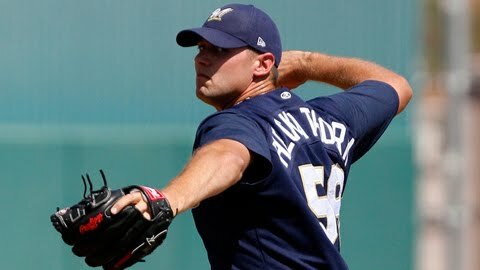 Tim Dillard - RP - His new delivery has really seemed to settle in since the Triple-A season started. Dillard has yet to walk a batter through 14 innings and has an ERA of 1.93. He'd be better than Jeff Suppan. Zach Braddock - RP - I think the word you would use to describe Braddock would be "dominant." He's been lights out, striking out 17 and walking only two in 9.2 innings and has yet to give up a run. Braddock will see time in the majors this season, the only question is when. Yea, he'd probably be better than Suppan too. John Axford - RP - Seems like the choices in Triple-A are pretty good for relief pitchers. Axford is also off to a good start, his ERA is 3.24 and he's struck out 12 while walking only three. If he can keep his command he'll likely see time with the big club before long as well. Also better than Suppan. Mitch Stetter - RP - Not really a prospect, but Stetter was sent down to make room for the 14.5 million dollar man, Jeff Suppan. For the Sounds the Brewers only lefty specialist has pitched 6.1 innings and has yet to give up a run. Should I say it? Yea... better than Suppan. I think what we've learned is that Jeff Suppan has no business being on the major league roster and there are plenty of minor league pitchers that could do his job better than he can.